Finished with the 7th painting in the Market Series. Auction Link. I changed the order of the paintings. In a previous post, I labled this one as #8 but as you can see, I haven't finished the painting with berries so if I do it will be #8. I might have one more in this series. The images are from a trip my husband and I took to Italy a few years ago. 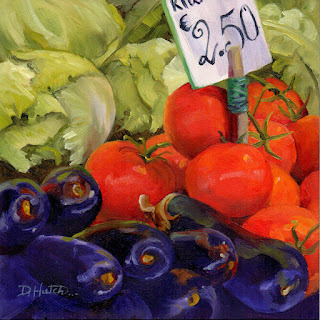 I am looking forward to painting more fruits and vegetables from my local green market.